Our product range includes a wide range of gas purification system for icp, gas purification system, gas selector box, gas purification panel for chromatography, gas purification panel and gas purification filter for lcms. Gas Purification Panel for ICP, We are a renowned name in the industry to offer our patrons a premium quality range of Gas Panel for AAS, ICP, GCMS. The offered panel is widely used in various industries for numerous purposes. Using quality approved components with the aid of contemporary methodology; the provided panel is exclusively manufactured at our sound production unit under the stern surveillance of qualified technocrats. For its unique features like easy usage and high functioning, the offered panel is highly demanded by precious clients. With the Gas Clean Filter System, you can be completely confident that your gas supply contains less than 0.1 ppm of moisture. The system will not suffer from hydrolization damage, saving you expense and needless downtime in replacing degraded components. Our moisture filters offer unsurpassed protection against moisture contamination for your GC system. A GC/MS Filter that delivers faster stabilization times for lower gas consumption and faster set-up time. The single filter unit with a combination of fi lters removes oxygen, moisture, and hydrocarbons from carrier gas for MS applications. A Moisture Filter that also delivers faster stabilization times for increased productivity in GC. Water removal prevents needless hydrolization damage to the stationary phase, fused silica surface, glass wool, or septum. An Oxygen Filter that prevents oxidation of the liquid stationary phase, septum, or glass wool in GC. A Process Moisture Filter, process connecting units, and male connectors, free from any brass and copper, for safe use with acetylene in process GC. A Charcoal Filter that removes organic compounds and ensures correct performance of FID detectors in GC. A new Carbon Dioxide Filter that eliminates CO2 from supply gas. When combined with a Moisture Filter, it is ideal for zero-air gas generators. introduced a high flow connection unit that handles flow rates up to 20 L/min for collision gas applications, supply gas for ICP and ICP-MS, or any application where high flows are required, expanding the range of applications you can run. For operations requiring flows above 10 L/min, you can save money by using cheaper gas and by eliminating contaminants. Each Gas Clean Filter is compatible with both the high flow and standard connection units. All GC applications benefit from the use of Gas Clean Filters, whether your GC is connected to an FID or MS or to any other type of detector, such as flame photometric, thermal conductivity, electron capture, nitrogen-phosphorous, or thermionic. 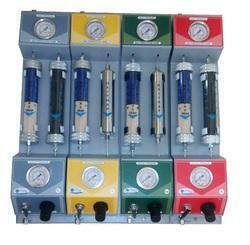 This system will provide in-line contaminant removal for your GC gases. This system has convenient replaceable cartridges with a visual indicator. 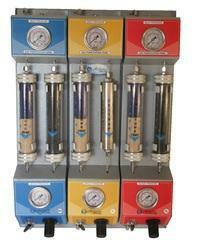 The Athena Gas system consists of three cartridges in series to reduce column damaging impurities. The first cartridge in the system will remove residual hydrocarbons and water from the carrier gas stream. The second cartridge provides high-capacity oxygen removal (capacity is least 1000 cc of pure oxygen); the third cartridge contains an inorganic indicator that changes from light green to gray to provide warning when the high-capacity oxygen trap is depleted. All systems are helium leak tested after assembly. Approximate dimensions: 33 cm W x 33 cm H x 8 cm D; weight 4 kg. 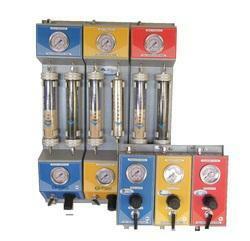 Keeping in mind the precise demands of our treasured patrons, we supply Gas Purification System . This product range is completed at advanced premises using quality approved raw material in compliance with worldwide quality standards. In order to meet the worldwide quality standards, the entire range is stringently tested on different parameters. Furthermore, this range is available at inexpensive rates for our precious customers. 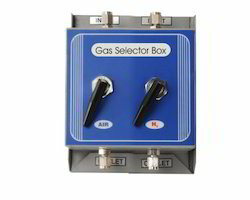 Gas Selector Box is used for the selection between two gases of different types. Two types of gas selector box available one with selector valve, pressure gauge & toggle valve, another with only two toggle valve. Standard system consists of a panel incorporating gas controls and purification traps for four gases in a unit, namely, Nitrogen, Helium, Hydrogen and Zero Air. Frequent changeover of carrier gas from Helium to Nitrogen is required for certain Gas Chromatographic applications. Hence, Gas Selector Box is used for the selection between two gases of different types. This uses a special Gas Sampling Valve which takes care of leakage problems especially faced while using Helium. Two types of gas selector box are available one with selector valve, pressure gauge & toggle valve, another with only two toggle valve. Delivering Clean Gases For Accurate Analyses Enhanced gas quality for maximum productivity The Athena Gas Clean Filter System delivers clean gases, reducing the risks of column damage, sensitivity loss, and instrument downtime. Contaminants in gases can signifi cantly affect your analysis. Oxygen, hydrocarbons, and moisture can cause loss of sensitivity and accuracy of the GC and damage your column. Impurities activate glass wool in liners and accelerate septa degradation, causing high background signals and ghost peaks and leading to time-consuming troubleshooting. Oxygen in the supply gas for ICP-OES or ICP-MS can cause plasma shut-down and loss of sensitivity. Carbon dioxide in supply gas for TOC analyzers causes elevated baselines and loss of sensitivity and accuracy. Save costly gases through toggle valves & gas distribution panel. Gas distribution panel is used when there is more than one Gas Chromatograph. It helps to controlled the flow & pressure of different gases for different GC's. 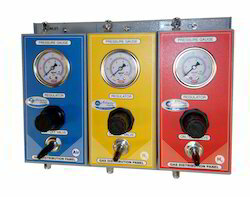 Gas distribution panels are available in three different types. 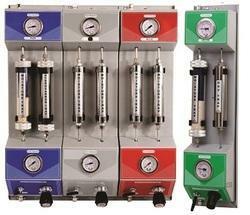 One is with pressure gauge (to indicate pressure), pressure regulator (to control pressure), ON/OFF valve (to isolate). Second with pressure gauge and ON/OFF valve. Third is with only ON/OFF valve. Gas Selector Box is used for the selection between two gases of different types. Two types of gas selector box available one with selector valve, pressure gauge & toggle valve, another with only two toggle valve. Standard fittings like Nuts, Ferrules, Union, Coupling, Clamps, Hardware etc. In our extensive product range, we are engaged in providing a quality assured range of Gas Purification Panel (Gas Purification System). This panel is used to remove oxygen, moisture, hydrocarbons, oil and other foreign materials from gas streams. The panel eliminates noise and unaccepted signals of gases in order to obtain peak resolution and peak tailing in the analysis. Our adroit workforce manufactures this panel making use of quality tested components and modern techniques according to the set industry standards. Looking for Gas Purification And Control Panel ?